Handcrafted in 20 barrel batches, this American Pale Ale has hints of citrusy hops with a crisp, peppery finish derived from Grains of Paradise. 50% of all profits from the sale of Silverback Pale Ale go to the Mountain Gorilla Conservation Fund. Wild, western lowland gorillas in Africa consume this rare spice found in their native habitat. 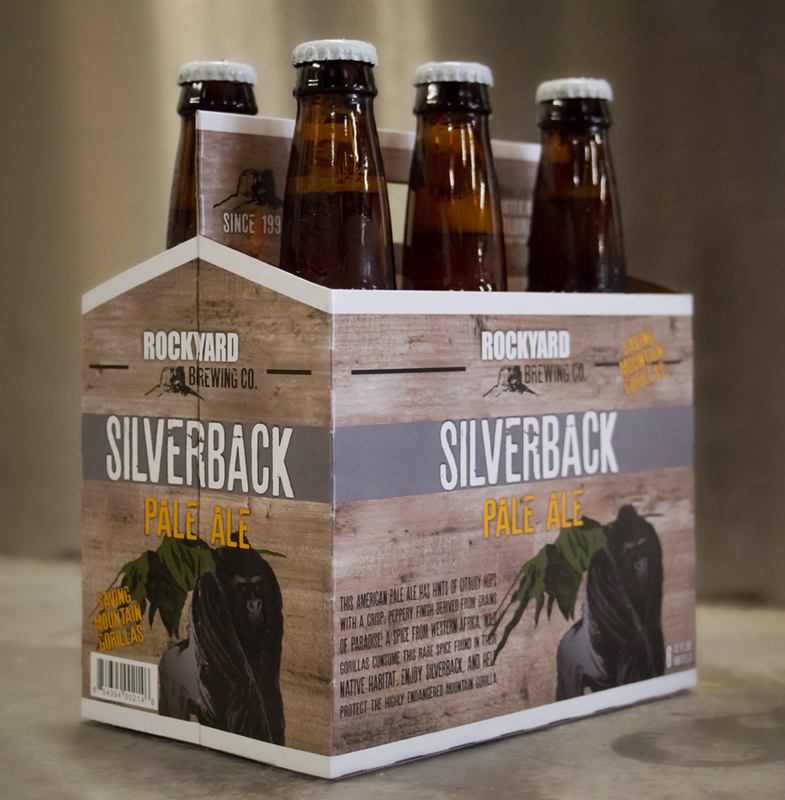 Silverback Pale Ale is a comfortable 5.5% ABV with a balanced hop finale of approximately 40 International Bittering Units. It is made with American two-row malt, crystal malt, specialty malts and four US hops. Micro-bottled, American-style, artful, pale ale is a fundraiser beer for the Mountain Gorilla Conservation Fund (MGCF). This delicious craft beer is made with an addition of Grains Of Paradise and has a citrusy hop aroma, crisp pale malt flavor and satisfying hop character. 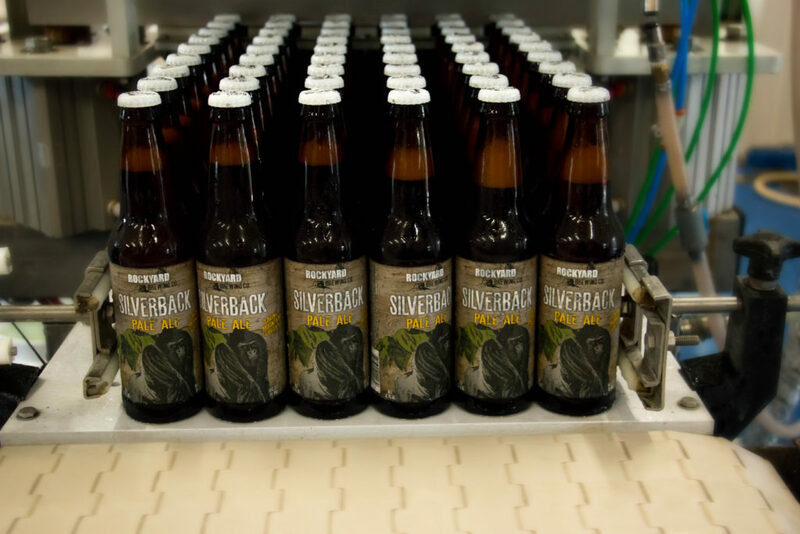 Silverback is the first beer in the country to be tapped in a Govenor’s Mansion. Silverback Pale Ale, was the first small batch keg tapped at the mansion; and the plan is to rotate unique small batch brews from breweries all across the state. We are all very proud the Governor selected Silverback to lead the way accross the nation and chose a beer that has a very important misson of supporting mountain gorilla conservation. Rockyard American Grill and Brewing Company Owners Mike and Jeff Drabing have always had a passion for good friends, great beer and awesome food. In 1999, Mike and Jeff brought that passion to life when they opened the Rockyard American Grill and Brewing Company in Castle Rock, CO. Living in a Rocky Mountain paradise is just part of the perks of owning and operating Caste Rock’s largest craft brewery. Our ingredients and brewing practices reflect directly on our environment and we take great pride in paying homage to this beautiful place we call home. A very unique, and very tasty, addition to Silverback. It is an African spice that imparts a citrusy, pepper-like quality to the beer. The spice is a vital part of the mountain gorilla diet and aids in reducing heart disease in these endangered apes. Founded in 1983 to carry on the work of the late Dr. Dian Fossey, conducts numerous projects to benefit the mountain gorillas of Africa. Fifty percent of all profits from the sale of Silverback Pale Ale got to MGCF.